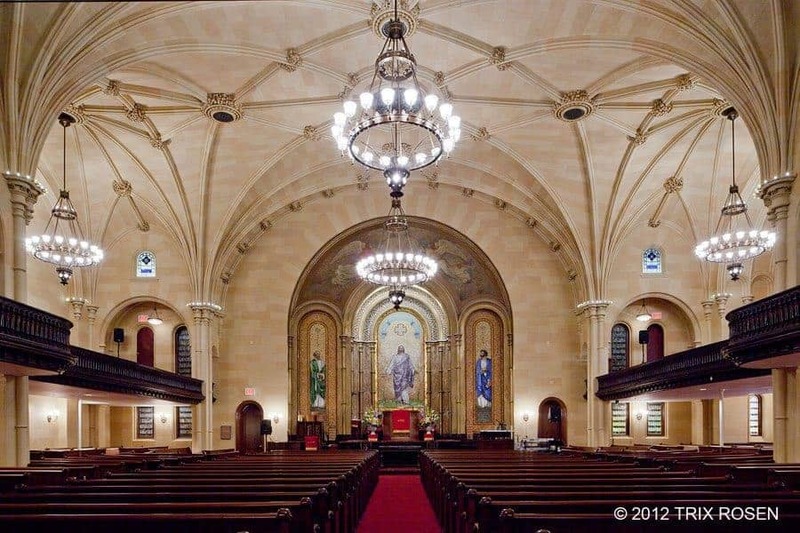 I was invited to attend the New York Landmarks Conservancy “Lucy G. Moses Preservation Awards,” on April 25th 2012 by my colleagues at Li-Saltzman Architects, PC who were receiving a “Lucy” for their restoration work of the Gothic Revival sanctuary, the Brown Memorial Baptist Church. The Awards, nicknamed the “Preservation Oscars,” are the Conservancy’s highest honors for outstanding preservation of historic structures. I was proud to have taken the photographs that documented their project and to know that those images helped Li-Saltzman receive the recognition they deserved. It was Roz Li and Judith Saltzman who had encouraged me twenty years ago to shoot historic preservation assignments. Roz had praised my commitment to the documentary series I had produced about the Philippines, and hoped I would bring a similar passion to historic work. One of my first architectural assignments for her company was documenting the Lower East Side Tenement Museum in New York City. I photographed the “before and after” restoration, floor by floor, over several years, until the project was completed. 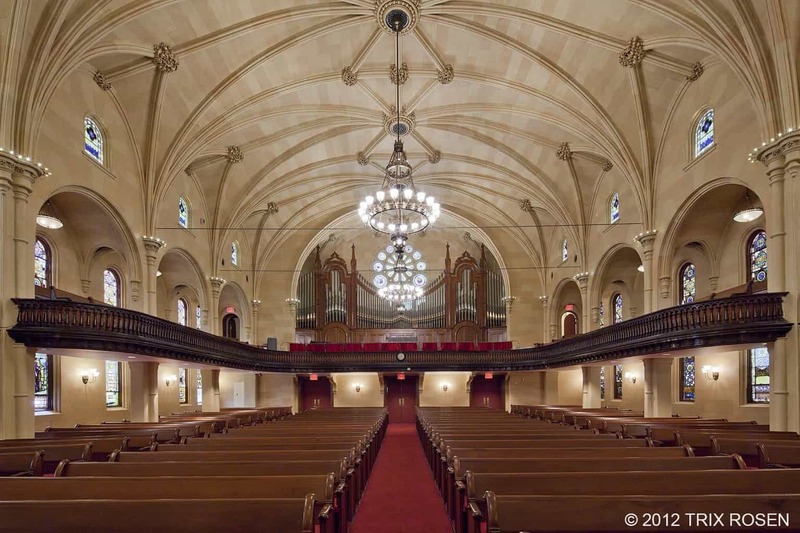 The Lucy G. Moses Preservation Awards ceremony served as a joyful reminder of why the company of historic preservationists is such an honor, and why I view the profession as the “human rights” work of the architectural world. “The time and care that went into completing these projects demonstrate New Yorkers’ commitment to preserving the entire range of the City’s historic architecture,” said Peg Breen, president of the Conservancy to the audience. When John Belle, FAIA, a founding partner of Beyer Blinder Belle Architects & Planners, LLP, received the Preservation Leadership Award for his four decades of acclaimed work (including the South Street Seaport, Grand Central Terminal and the Ellis Island Immigration Museum), he humbly described how working in preservation is a “team effort.” Roz Li told me that historic preservation work is “a labor of love,” because projects like the Brown Memorial Baptist Church can take a decade to complete due to the complexity of financing. And when Rev. Clinton M. Miller and Mrs. Aquilla Middleton from the Church received their “Lucy’” award the Reverend spoke about the importance of the restoration of the Church to the community it served. Indeed, photographing this assignment I was inspired by the work of my colleagues and by the spirit of the congregation. 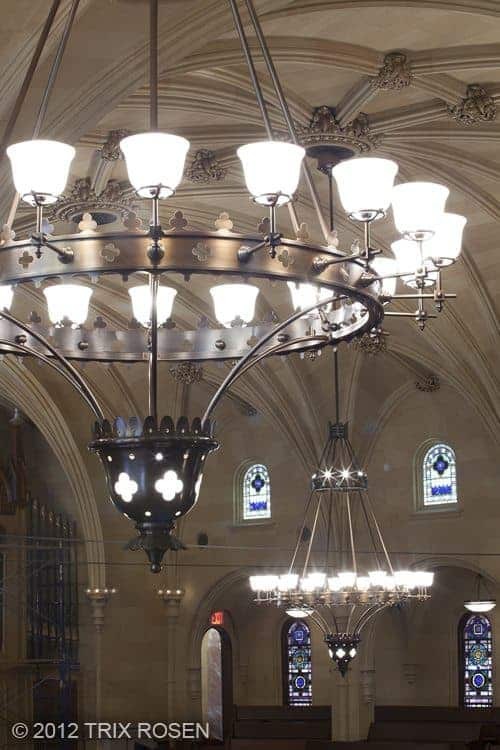 I sought to creatively balance the light from the sconces, chandeliers and LED bulbs so that their combined glow could reveal the divine beauty of this historic sanctuary as well as find the perfect composition to record the architectural details. Congratulations to Roz Li and Zach Rice of Li-Saltzman Architects, and all the other “Lucy” Award Preservation winners including my friend, Lew Gleason, of Jan Hird Pokorny Associates, for his restoration work on the Edgar Allan Poe Cottage. 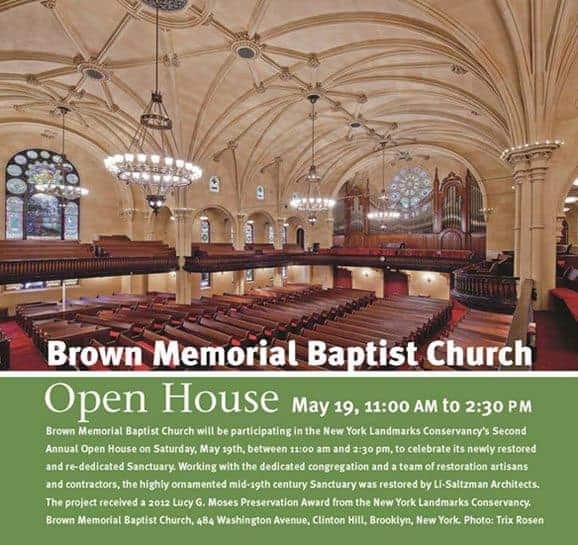 This post congratulates Roz Li, Zach Rice and Li/Saltzman Architects, PC for their beautiful restoration work of the Brown Memorial Baptist Church in Brooklyn NY. 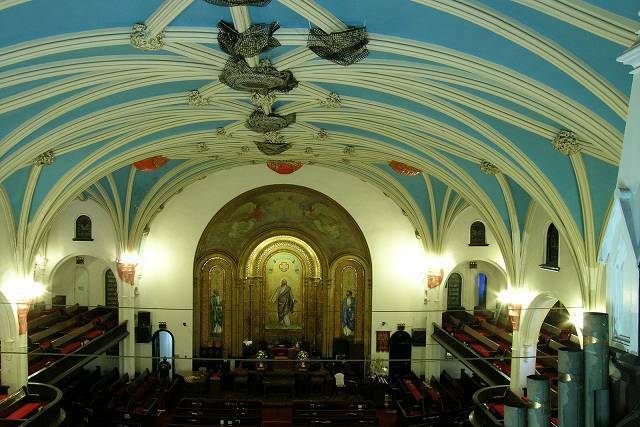 Li/Saltzman has been working with this church since 2001. 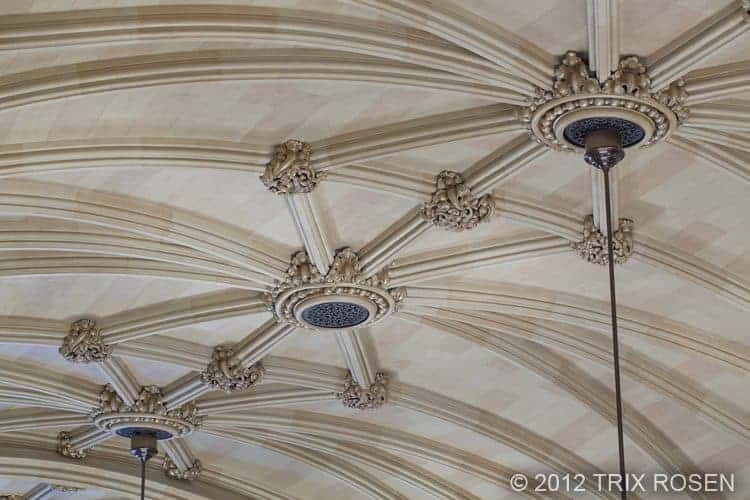 They started with the restoration of the exterior – restoring the brick, replacing the roof, recreating the missing stone turrets and the structural stabilization of the roof trusses. 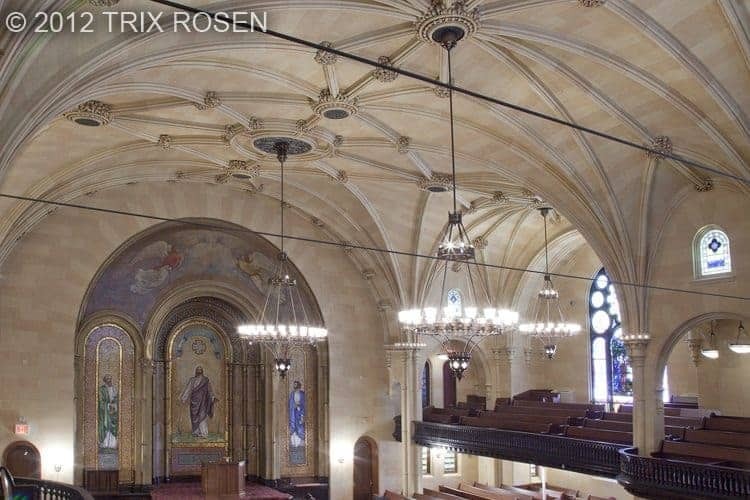 Once the exterior envelope was stable and watertight, the restoration of the sanctuary interior began. Roz explained more about the history of the project, “Before the restoration the plaster walls and ceilings were cracked, and we had to net the heavy plaster ornamental medallions for fear of them falling. There were no chandeliers, and the lighting that existed was full of glare. 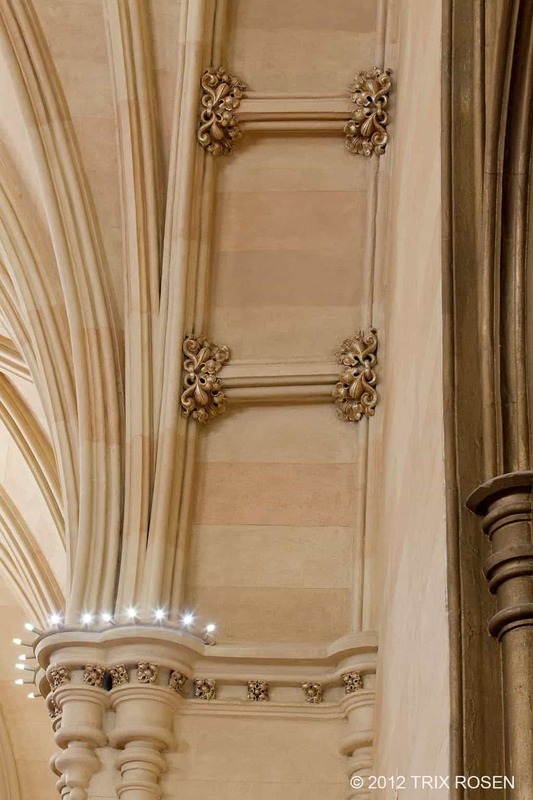 We did some probes and found out that beneath the paint, the original finish was tinted plaster made to look like stone with scored joints, and each simulated stone panel was a slightly different shade than the next, just as natural stone would have been.